Synopsis: The old Cape Cod house that Laney Coleman shares with her minister husband Noah and their five boys is usually brimming with cheerful chaos. There’s nothing fancy about the ancient kitchen or the wooden floors scuffed by the constant parade of activity and the clicking claws of their two Labrador retrievers. It’s a place to savor the sea breeze wafting through the windows, or sip coffee on the porch before another hectic day begins. This summer, life promises to be even busier than usual, because Noah’s younger brother, Micah, wants to hold his upcoming wedding on their property. My take: Nan Rossiter has done it again. She wrote a wonderful multi-generational story that will resonate with many readers. It certainly did with me. I related most with Laney. She really has her hands full as she balances a job, motherhood and being wife of a minister. She even agrees to host a wedding at their home after her husband volunteers. As most mothers do, she quietly deals with other issues at the same time. A side note: when my kids were growing up one of our favorite TV shows to watch together was Seventh Heaven. If you’re unfamiliar with the show it was about the life of a minister, his wife and kids. This novel gave me the same feel as that show – which I think is high praise! We loved it and I enjoyed Under a Summer Sky just as much. Noah, Laney’s husband, delivered a sermon that struck an emotional chord with me. It was about appreciating and being present in every moment – especially the small moments. You never know when the last time you do something will be the last time. Anyway, when I finished that chapter I had to stop and wipe my eyes. 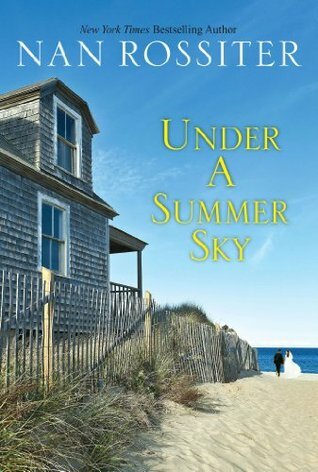 Under a Summer Sky celebrates family connections and the truly important things in life. I’ll be sharing this novel with my sisters and close friends. Synopsis: Losing her father on the night she was born could have torn Beryl Graham’s family apart. Instead, it knitted them together. Under their mother’s steady guidance, Beryl and her older sisters, Isak and Rumer, shared a childhood filled with happiness. But now Mia Graham has passed away after battling Alzheimer’s, and her three daughters return to their New Hampshire home to say goodbye. My take: When the three Graham sisters come together to prepare for their mother’s funeral they find out things they never new about her – shocking things. She left a memoir that told them everything and gave them a new perspective of her life. She raised her three daughters alone after a car crash took the life of her husband on the night of their 5th anniversary. They thought she never remarried because she couldn’t imagine loving anyone else but their father. Her memoir tells them the real story. Though dismayed by what they’ve learned, they take to heart the lesson to never take life for granted and to appreciate especially the mundane events of everyday life. Timely advice because all three are at crossroads in their personal lives. More Than You Know is a novel of faith and family that will resonate with many readers. I enjoyed it. *Note: At the end of the novel Nan Rossiter shared a couple of recipes made by the Graham sisters. I’ve made copies and plan to try both! 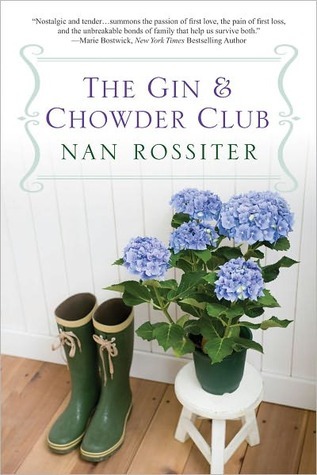 Last week I blogged about Nan Rossiter’s novel The Gin & Chowder Club. Nan graciously offered to send a copy of her book to one of my US readers. To enter, click here (Giveaway now closed) and complete the form. I love your comments but you must fill out the form to be entered in the giveaway. About: (Back of the book) The friendship between the Coleman and Shepherd families is as old and comfortable as the neighboring houses they occupy each summer on Cape Cod. Samuel and Sarah Coleman love those warm months by the water; the evenings spent on their porch, enjoying gin and tonics, good conversation and homemade clam chowder. Here they’ve watched their sons, Isaac and Asa, grow into fine young men, and watched, too, as Nate Shepherd, aching with grief at the loss of his first wife, finally found love again with the much younger Noelle. My brief take: I liked the idea of this novel. The setting is beautiful, the characters for the most part seem like normal, decent people, and two of them struggle with an epic moral situation. Nan Rossiter let it play out – and kudos to her for doing so. Given the Christian fiction tone I was kind of surprised by that. Because of the moral issues there would be a lot for book clubs to discuss. I loved the book cover as well as the brief chapters. I read The Gin & Chowder Club in one day – I liked that I could set it down and pick it up without feeling the interruptions.